31.17/100 – that’s the average PWA score for eCommerce sites. If we consider that there are over 2.5 billion smartphones being used by potential shoppers worldwide, that’s news that should alarm business owners. Today, mobile is one of the fastest growing and most important touchpoints for eCommerce. As the eMarketer estimates, retail eCommerce sales, with a 23% increase over the previous year, reached $2.304 trillion in 2017. The mobile share of these sales stood at 58.9% and it is predicted to take 72.9% by 2020! Judging by the vivid discussion in the eCommerce community, it might seem like online stores are prepared for this ongoing mobile-first revolution. But as the State of mobile-first eCommerce reports, most online stores have a long way to go to catch up. 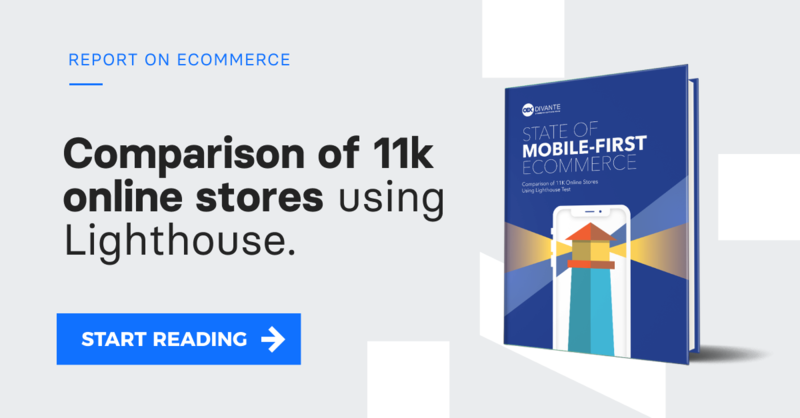 The State of mobile-first eCommerce report audits over 11,000 online stores across the globe, including the biggest eCommerce stores from the U.S., Germany, Russia or U.K. The analyzed stores represent various industries like clothing, electronics, food, and entertainment. Their quality and mobile-first readiness were audited with Google’s Lighthouse test. The results presented in the report aren’t optimistic. Speed and an engaging UX should be top features of mobile-first eCommerce, but the performance and accessibility audit average scores are 35.66/100 and 58.34/100 respectively. PWA features, the future standard for web apps, aren’t the strong either. The average score for the analyzed shops is only 31.17/100. Of the top 5 eCommerce markets, Germany is the top-market when it comes to PWA standards. The worst situation is in the UK and US. Analyzing the top 5 eCommerce platforms showed us that the best PWA score is achieved by Prestashop and the worst – Shopify. The poor condition of mobile commerce is confirmed by the so-called mobile gap. Reaching over 47% gap refers to the difference between high mobile traffic and significantly lower sales among the mobile users. Most online shops face the great challenge of adjusting to the mobile-first revolution. That includes improving loading and interaction times, as well as building clear communication patterns with mobile users in order provide them with a seamless mobile shopping experience. “Brands should look for tools that will not only positively affect the experience of mobile users, but are also quick to implement. PWA is one such solution” – Tom Karwatka, Divante CEO. The PWA implementation can be a quick win in many cases. This new standard in rich in mobile-native features, like a mobile app feel and offline readiness, that help to build an engaging user experience that increases conversion rates (e.g. it increased Alibaba’s CR by 76%). What’s more, thanks to Service Workers, a PWA is extremely fast, even in areas with poor connectivity. The PWA standard also affects such metrics as engagement rate, number of page views per session, load time and bounce rate. The business results are quite obvious. Learn more about PWA Standard for eCommerce.